ein hod: Ein hod artist "... shattered mental barriers to find freedom of expression..."
Ein hod artist "... shattered mental barriers to find freedom of expression..."
Alex Arbell produced fine scientific glassware for 25 years -- "for half of my life" -- as he puts it. "Only in my mid-40s did I make a shift toward the arts. Arbell will be a featured demonstrator at the international Glass Arts Society conference to be held in Pittsburgh next week. Society president, glass artist Shane Fero, writes of Arbell: "Besides being an interesting artist with unusual techniques (at least in this country), he is an awesome person (a philosophical type) who people love to hang with and garner wisdom." 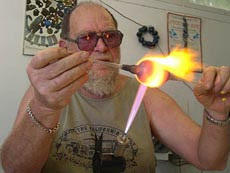 Making scientific glass and making art glass require the same equipment, material and technique, Arbell points out. "It's a shift that you have to make in your head." A large part of that, he explains, is "demolishing established mental disciplines [to] create a new freedom" of expressionHe was born in 1933 in Krakow, Poland, and left with his family in 1940 when the Germans invaded. He describes their experience as a typical story, shared by so many, traveling through Europe as refugees before finally settling in what was then Palestine. Now he lives with his wife, son, 12, and daughter, 13, (he has two children, now in their 40s from a previous marriage), in a village populated by artists that has become a cultural tourism destination. It was founded in 1953 by Dada artist Marcel Janco and others, and about 150 artists and their families now live there. The village on the slopes of Mount Carmel, about a 10-minute drive from the Mediterranean, has a small grocery store, a couple of restaurants and an amphitheater where concerts are held. But children have to travel elsewhere to attend school.The residents represent a mix of many cultures, so common in Israel, Arbell says, where people come from around the globe. While there are other artists who work with glass, Arbell is the only glassblower in Ein Hod. "It's very picturesque," he says, "one of the most beautiful places in Israel." How nice to find you here on line. I guess it's close to 13 years now since I last set foot in Israel. I send warm wishes to you and your family. Please give my best to Daphna.